The Hôtel des Ivalides was commissioned in 1670 by Louis XIV in order to provide accommodation and hospital care for wounded soldiers. In 1815, after Napoleon's abdication, over 5,000 survivors of the Great Army were listed there. Napoleon inspected the place and visited his men in 1808, 1813 and 1815. 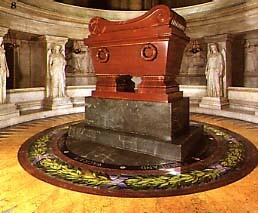 The chapel of the Invalides was built at the end of the 17th century by Jules-Hardouin Mansart and contains Napoleon's tomb. In 1840, during the 'Return of the Ashes', a law passed on 10th June ordered the construction of the Emperor's tomb below the dome of the Invalides. A national funeral was celebrated on 15th December and the body was laid to rest temporarily in the chapel of Saint-Jerôme until Visconti had completed his work. The coffin was subsequently transferred to the chapel on 2nd April, 1861, in Napoleon III's presence and set up in a red porphyry sarcophagus in the middle of a circular uncovered crypt. Visitors enter the crypt via a staircase. This leads to a heavy bronze door (forged from cannons taken at Austerlitz) flanked by two statues. Above the lintel is the following inscription (an extract from Napoleon's will): “I wish my ashes to rest on the banks of the Seine among the people of France whom I so much loved“. The sarcophagus was put up on a green granite pedestal and contains a nest of six coffins: one made of soft iron, another of mahogany, two others of lead, one of ebony and finally the last one of oak. Napoleon is dressed in his Colonel's uniform (of the cavalry of the Guard) which bears his sash of the Légion d'Honneur. His hat rests on his legs. On the floor, a polychrome mosaic illustrates the main battles of the Empire, while twelve huge Victory statues by Pradier are mounted up against the pillars of the crypt. A circular gallery houses ten white marble bas-reliefs by Simart, all showing episodes from Napoleon's reign. Halfway along the gallery, there is a vault containing the coffin of the King of Rome, transferred there on 15th December, 1940, and placed under a marble slab in the crypt on 18th December, 1969. Over the tomb stands a statue by Simart representing Napoleon as a Roman emperor. Inside the church, two side chapels contain the tombs of Joseph and Jerôme Bonaparte. The gilt bees on the walls of the chapel of Saint-Jerôme serve to remind visitors that the Emperor's coffin lay here while the crypt was being transformed. The Military Museum (whose director is officially the “Keeper of the Emperor's tomb”!) is housed in one wing of the Invalides. It was opened in 1905 and combined the Artillery Museum and the Historical Military Museum. It is France's greatest military museum and one of the biggest in the world. The Turenne room on the ground floor, the soldiers' former dining hall, has on show flags, trophies and standards from every period in history. Of particular note are: the painting by Ingres “Napoleon on the imperial throne in 1804”; and the flag belonging to the first regiment of the infantrymen of the Emperor's Guard which Napoleon kissed during his farewell in Fontainebleau. The rooms on the second floor are arranged in chronological order: those devoted to the monarchy are followed by an evocation of the Italian and Egyptian campaigns. The Boulogne room contains a few of the Emperor's personal possessions, notably: his saddle for the Coronation, his sword at Austerlitz, his sash of the Légion d'Honneur, his grey coat, his hats and a (pitched) military tent. The following rooms are dedicated the Emperor's brothers and the Marshals of Napoleon's Great Army. In the Eylau room is “Le Vizir”, Napoleon's horse (stuffed), and the Montmirail room exhibits a painting by Delaroche “Napoleon I in Fontainebleau during his first abdication“. The Restoration room is devoted to the islands of Elba and Saint Helena. Here visitors can see a reconstruction of Napoleon's drawing room with the Emperor's deathbed, various pieces of furniture and his personal belongings. RER: line C, Invalides station. Musée de l'Armée: Open every day, from 1 October to 31 March, from 10am to 5pm, and from 1 April to 30 September, from 10am to 6pm. Closed every first Monday in the month, 1 January, 1 May, 1 September and 25 December. Dome and tomb: same opening times but accessible from 10am to 7pm from 15 June to 15 September.